It’s not going to mow your lawn, but the freshly revealed, wifi-friendly Roomba 980 can be controlled by your smartphone, and it uses a camera and sensors to remember where walls and furniture are in your home. At an event this afternoon in New York, the huge robotics company repeatedly highlighted the benefits of a Roomba that’s able to map out your home. How does it work? Using visual localization and cloud-connected app control, the robot vacuum can paint itself a better picture of how your home is laid out. Where are the lamps? Where are steps? Where’s Fido’s dog dish? Aunt Mabel’s hand-blown vase? Et cetera. 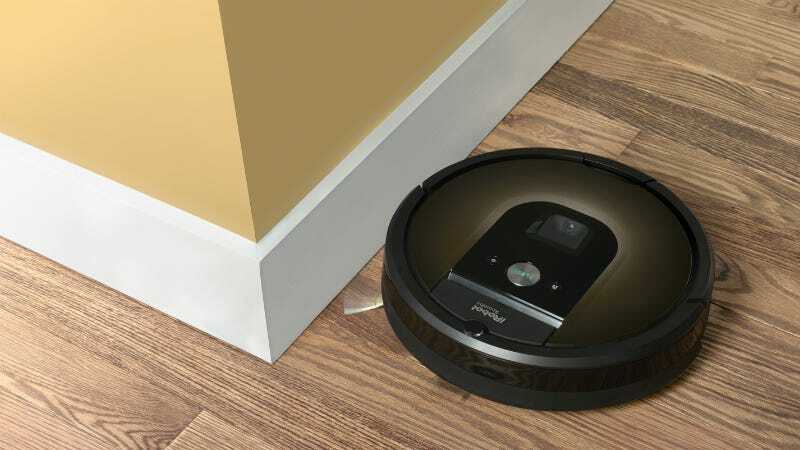 The company says that it’s even outfitted with sensors that’ll make the Roomba spontaneously adjust its cleaning patterns in order to avoid running into moved furniture or crap on the ground. The trusty sweeper cleans for up to two hours before automatically roaming back to its charging station. As goes for all robots, this sort of on-the-fly learning is the biggest challenge in the field right now. Sure, it’s one thing to plop an industrial bottle cap-screwer on an assembly line and program it to do the same thing, in the same spot, day in and day out. But granting machines the ability to adapt to changing situations is tough. That’s why the idea of a Rosie the Maid-type humanoid assistant is such a daunting technical task. iRobot is also tapping into the ‘bot zeitgeist by making the 980 a member of your “smart” home; an appliance that operates within the Internet of Things. The company’s new cloud-based Home app, available for Android and iOS devices, lets you schedule cleaning time for the robot 24/7 from any location. Speaking of changing environments, the 980 can figure out what kind of surface it’s on at any given time—and if it’s a carpet or rug, it kicks into high gear, automatically doubling the power it expends. Optical and acoustic sensors help it sniff out places on the ground where there’s a particularly large pile of dirt, as well. It ain’t cheap, unfortunately. $899. That’s another big roadblock in keeping robots from exploding into the next must-have consumer electronic, as we’ve discussed before: high price points. Plus, for me, it didn’t seem that different from other Roombas. It’ll take a hands-on review to know for sure whether it can avoid objects, or remember where stuff in your house is. But the 980 seems to be tackling a lot of the roadblocks in robotics today. And that’s good! Looks like we’ll still have to wait a while for that smart lawnmower, though.